State-owned electricity producer Eskom has confirmed that boiler-tube leaks are a significant contributor to unplanned losses of more than 12 000 MW across its coal fleet. The underperformance of the coal fleet, including those units in commercial operation at the Medupi and Kusile projects, is also the main contributor to South Africa’s current bout of confidence-sapping load-shedding. Planned and unplanned losses fluctuate daily, but on the morning of March 19 when Eskom and Public Enterprises Minister Pravin Gordhan briefed the country on the status of the system, which has been in the throes of Stage 4 load-shedding since March 14, unplanned losses stood at 12 098 MW, while planned outages stood at 5 771 MW. Boiler-tube leak repairs accounted for 2 717 MW of those unplanned losses, which also included losses from a stuck ash system of 593 MW, generator repairs of 1 125 MW, turbine repairs of 1 682 MW, high-pressure pipework repairs of 1 168 MW, partial load losses of 3 702 MW and outage delays of 754 MW. The supply shortages on the day were being exacerbated by the loss of 1 160 MW of capacity from the Cahora Bassa hydro scheme, in Mozambique, following damage to the transmission lines as a result of the deadly Idai tropical cyclone. It was being worsened further by depletion of diesel stocks at the Ankerlig and Gourikwa open cycle gas turbines, where diesel tank levels had declined, owing to below expected deliveries. The rise in boiler-tube leaks has been partly attributed to the fact that a boiler health maintenance contract, which expired in late 2017, had not been renewed, which had undermined Eskom’s ability to perform preventative maintenance. COO Jan Oberholzer said that when the contract was in place, a service provider had been performing ongoing assessments of the state of the boiler tubes across the utility’s 15 coal-fired power. 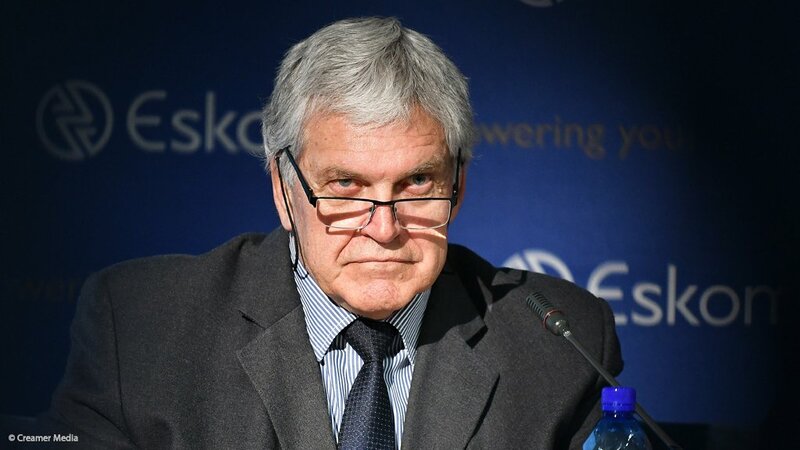 The diagnosis had then been fed into Eskom’s preventative-maintenance planning system so that leaks and likely future leaks could be addressed during planned outages. “Eighteen months ago that contract was stopped [and] we are in the process of getting it placed. Hopefully we will get it placed this week. The issue is an internal issue, so we cannot blame anybody but ourselves that this contract is not in place,” Oberholzer explained. He said the leaks were “biting us big time”, with eight units out of operation on March 19 as a direct result of the need to conduct urgent repairs. Each boiler has up to 600 km of tubing and it takes time to repair a leak, as the boiler has to be switched off and cooled before maintenance crews can gain access and locate the leaks. In many instances, tubing has to be cut away to gain access to the main leak, which has to be repaired and re-welded before the units can be returned to service. Eskom also reports that coal quality-related load losses continue, having fluctuated between 200 MW and 500 MW a day during the 2018/19 financial year to date, making up an average of 7.9% of partial losses. For the year to date, the Matla and Tutuka coal-fired power stations accounted for 74% and 13% respectively of the declared coal-related load losses. To remedy the quality issues at the tied Matla colliery, a high-quality two seam total extraction short-wall section will be re-commissioned in May 2019, while at Tutuka, a challenging geological area at the tied New Denmark colliery has been mined through, resulting in an improvement in quality in recent months. The utility reports that total stock days, as at March 17, stood at 67.5 days, with significant improvements at Camden, Hendrina, Majuba and Kendal which have all recovered to above the Grid Code level of 20 days. However, stocks at six power stations remained below the Grid Code-stipulated level.